Chipper for Parks | Let's Go Chipper! Remember the year 2000? In the United States, a pound of bacon only cost $3 and a gallon of gas set people back $1.26. The iPhone was still 7 years away from being introduced. But on September 2, 2000, some hearty adventurers, tired of being tied to an office cubicle day after day, launched Geocaching.com. The adventure to inspire outdoor play through GPS technology began. Just like any story-worthy journey, Geocaching.com’s beginning was filled with uncertainty. Before “geocache” joined the ranks of approved Scrabble words or a Geocaching game piece rocketed to the International Space Station, Geocaching.com launched with only 75 geocaches. Today the site lists the locations and descriptions of nearly 2.5 million geocaches. Adventure is truly waiting to be discovered all around you, as long as you’re in the 180+ countries where geocaches are hidden [hint: you are]. What we now know as the first geocache was hidden on May 3, 2000. The cost of running Geocaching.com was originally funded by the sale of donated tshirts. The word ‘geocache’ means ‘hidden location on Earth’, as ‘geo’ means Earth, and ‘cache’ is French for a hidden location or place. Hugh Jackman goes geocaching (and other celebrities like cyclist Jens Voigt). Share your Geocaching birthday wishes and personal geocaching fun facts (like when you started geocaching) on the Geocaching Facebook page. The mere mention of the word ‘treasure’ is guaranteed to light up kids’ eyes. So, why not take them on a real-life treasure hunt with geocaching? People use global positioning devices and the internet to seek out items hidden by others. “When my guys were 12 and 13 it was fun to do geocaching where you find people’s hidden items via internet clues and GPS. It’s done all over the world [and] it’s fun to hide items too,” says mom of two, Kerri Hopkins. Want to try it? Check out Geocaching.com for help and download their free app! Let’s Go Chipper into the Great Outdoors and find some Geocaches! When, where or what was your last Geocache? Share your story in the comments below or on Facebook! Start the new year off right by getting outdoors and supporting our national parks and open spaces! Not only do parks preserve the earth’s beautiful ecosystems and diverse animals, they help our children grow into conscientious, healthy adults. Studies show that kids who are exposed to nature, and engage with their natural surroundings, develop an appreciation for the environment and empathy for all living creatures. Nature helps us feel happier and expands our imagination. We feel calmer and more at peace in the outdoors. So with the New Year barely underway commit to connecting your children to your local parks and make a plan to visit at least one state or national park. Say “hello” to a park ranger and thank them for what they do to keep our lands available to all. There are a number of parks with Junior Ranger programs for kids. Click this image for more information! January 20, Martin Luther King Jr. Day, is the first Fee-Free Day* of 2014 so plan a nature trip for the long weekend. Here are some Chipper Tips for camping and hiking with kids! Chipper engages, excites and educates young children and families to become the environmental stewards of tomorrow through meaningful connections with our local, state, and national park systems. Kids delight in exploring paths, discovering critters, and playfully exercising while at the same time fostering community bonds. Get your “I’m Chipper for Parks” badge today! A portion of our profits go to a park of your choice. Learn more about our Chipper for Parks program! Purchase a Chipper for Parks badge or create your own collections can and donate to a park! Chipper has worked with Girl Scouts, community leaders, teachers, Park Rangers and more to help lead a new generation into the great outdoors. Chipper teaches the principals of Leave No Trace and important safety lessons to keep everyone on the path together. Read our Park Ranger Interviews to learn more about being a protector of nature! Teach your little one(s) more about conservation and keeping our planet clean with this fun and useful recycle craft! The majority of human waste going into landfills comes from consumer goods. We must find creative, alternative ways to reduce waste. Chipper’s recent partnership with Keep Phoenix Beautiful highlights the 5 Rs: Reduce, Reuse, Recycle, Reconsider and Reimagine! Reimagine a recycled can or container into a cute collections bin! Place it on your kitchen counter, in the classroom and help raise funds for parks. Once filled, visit your local park or make a trip to a national park and share the joy in supporting our park systems. Simply collect and clean a can, container or bottle. Print out our FREE Chipper for Parks Collection Can Label. Have your child color and write their name and the park they want to donate to. Cut out your decorated label so it fits on your can or container. Then tape (Chipper uses double-stick) or glue on to attach! Find a place for your recycled collection can. Parks need our support. As you walk the paths share with your child that their contribution is what helps maintain paths and flora and fauna. Our parks rely on government funding and donations so every coin counts! We’re Chipper for parks and this is our “Piggy Banks for Parks.” Help us spread the idea! Park Rangers are happy to share their knowledge about their park with our future environmental stewards and many parks run great activities and outings for kids. Find more ways to help our parks here or consider organizing a local fundraiser! Which park is your favorite? Share your answer and pictures of your Collection Can with Chipper! The truth of the matter is that children need engagement with nature—nature provides a tangible look at the world around us that technology simply cannot offer. For example, a child may learn about the difference between a seagull and a robin in a textbook, or even an online article or software. However, being able to physically go to a zoo, and interact with and see both the seagull and robin can arguably teach that child more than just learning about said animals in a textual manner. Kellert asserts that there is enormous complexity in nature. He states, “when you think about the variety and complexity of the everyday understanding, you realize how much adaptation and coping and classification and naming that goes on in response to this extraordinarily complex, complicated, diverse world that is beyond our self. You begin to realize how much opportunity there is for children to… name, to classify, to problem solve, to create, to think about how to…critically think and adaptive response to different elements of this dynamic, ambient, changing uncertain, surprising world that is the world of beyond just ourselves as a single species.” Clearly, there is mass importance in involving your child in nature. A very simple way is to teach your kids how to garden in the bounds of your own backyard! Focus on making it fun and interesting. If your kids actually are interested in the fascinating process of plant growth, animal interaction, etc., they’ll be more inclined to participate. Make sure you have the right tools. Having the right tools and equipment is not only essential but makes the gardening process more fun! Because your kids are beginning gardeners, choose plants that are easy to grow. Suggested plants include: Sunflowers, Radishes, Squash, Tomatoes (from seedlings), Lettuces, Peas and beans, Sweet peas, poppies,alyssum, marigolds, pansies or nasturtiums. Show you children the basics of planting seed! Beforehand, till and add nutrients to the soil—they can learn about this process afterwards. For now, focus on just helping your children plant seeds! Along with teaching them how to garden, introduce the various types of wildlife that are involved with garden life. This will add an extra dimension to your children’s nature education. Clearly, there are many benefits to exposing your child to nature; additionally, it’s super easy to introduce nature into their education! Let’s Go Chipper for nature and education! We are definitely Chipper for Parks! Parks are places for us to clear our minds and enjoy our surrounding. They are places for our kids to free their imaginations and explore nature! 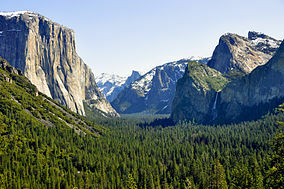 Stretching over 1,200 square miles (761,268 acres) of central California, Yosemite National Park is one the largest and oldest parks in America. With almost 4 million visitors each year, it is also one of the most frequented parks in the country. It’s no wonder why so many people travel from far and wide to visit if you have ever been lucky enough to visit before. The park’s forests of Redwoods and Sequoias and it’s huge valley’s filled with waterfalls and gigantic rock formations are awe-inspiring indeed. Yosemite is full of opportunities for fun activities in the great outdoors! 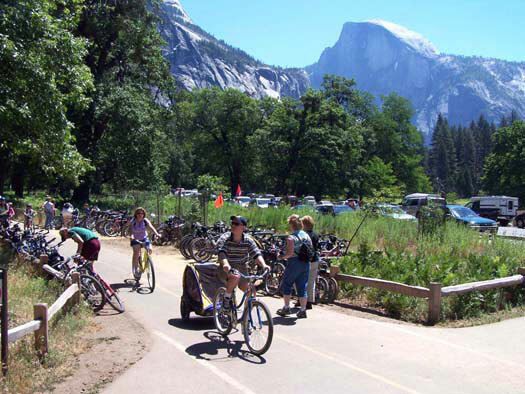 Explore Yosemite by hiking or biking. Spend some time with a park ranger learning about Yosemite or get a broad overview by taking a bus tour. You can teach your children to give back to the planet and help Yosemite by volunteering for a few hours (Memorial Day to Labor Day). Your kids will love becoming apart of the historical Junior Ranger or Little Cub! The Junior Rangers reach back to the Yosemite Junior Nature School, organized in June 1930 and lasting until 1954. In 2010, more than 24,000 children became Yosemite Junior Rangers (up from 6,000 in 2007). Learn more about Junior Rangers with these links. Consider visiting the Nature Center at Happy Isles (summer only) or the Yosemite Valley Visitor Center for interactive exhibits. Don’t forget to earn your FREE Chipper for Parks Badge on your next park visit by posting a picture of you and your tot in nature on Chipper’s Facebook Page, or give back to a park of your choice– in your name– when you purchase a badge here! The Yosemite Guide has information about all scheduled activities and hours of operation for services. Visit here for more information on this national treasure.